In mythology and literature, a quest, a journey towards a goal, serves as a plot device and (frequently) as a symbol. Quests appear in the folklore of every nation and also figure prominently in non-national cultures. In literature, the objects of quests require great exertion on the part of the hero, and the overcoming of many obstacles, typically including much travel. The aspect of travel also allows the storyteller to showcase exotic locations and cultures (an objective of the narrator, not of the character) (Wikipedia). 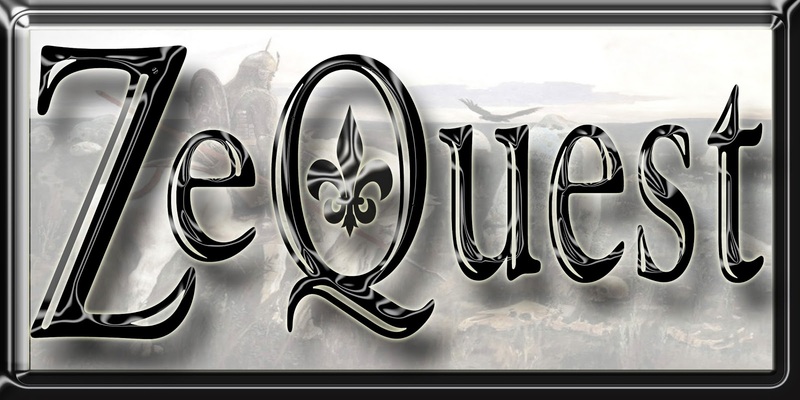 "ZeQuest" suggests video games or series of products having to do with a hero's search/quest for the "Holy Grail." Other uses for this term are possible, but this use is most obvious to us. No trademarks were found on the term "ZeQuest" or "Ze Quest" on the USPTO.gov or Trademarkia.com data bases. However, a trademark was found for SeQuest for "computer software for performing biomolecular analysis by analyzing data from mass spectrometers." We disclose this information because ZeQuest, depending on usage, may be considered a typo of SeQuest; "Z" and "S" are near each other on the qwerty keyboard. If you avoid product confusion with the SeQuest mark, you should be okay. For more information, consult with a trademark lawyer. *The background of the logo is a public domain illustration: “The Knight at the Crossroads,” Viktor Vasnetsov, 1878, found on Wikipedia. For more information regarding rights of public domain works, please consult with a copyright lawyer.